GALION — The RSVP program of Crawford, Marion, and Morrow Counties has a new coordinator. The organization’soffice is in the Galion-Crestline Chamber of Commerce home on Harding Way West. Galion resident Eric Palmer has taken over the RSVP Coordinator position, previously held by Sarah Capretta. who has moved on within the organization to become the assistant director for an area covering ten counties, including Crawford. For more information, give Palmer a call at 567-393-6446 or visit the RSVP website. Capretta still works out of the Galion office. 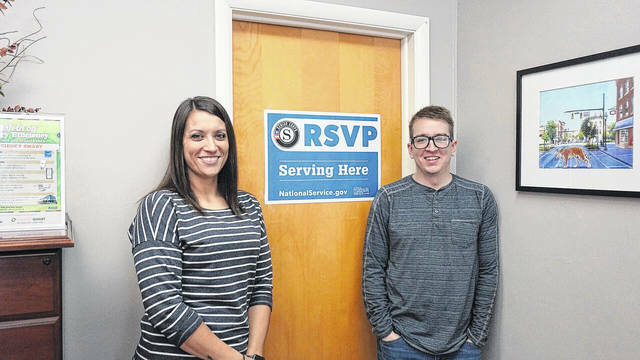 Her new role with RSVP expands her responsibilities as she is now the support person for RSVP Coordinators in a larger area. She will direct coordinators on their day-to-day functions for special events and funding opportunities in their area. Palmer is a native of Barnesville, Georgia and attended Gordon College, where he played soccer. He came to Galion a few years ago to be near family. He is the head coach of the Galion High School girls soccer team as well as a coach for the Galion Soccer Club. He also is vice president of the soccer board. Palmer officially started his new job Dece. 26 of last year upon leaving his position with Schilling Graphics of Galion. RSVP is a program for volunteers aged 55 and older. There are numerous service opportunities in the Galion area for volunteers, involving local food pantries, school mentoring, The American Red Cross and meal deliveries. Volunteers are given training as needed for their specific duties at a “station” or community agency and are able to pick an assignment that accommodates what personal schedule they may have. One program important to Palmer is the Crawford County Mentoring Program. This program is active in many schools in Crawford County including, Galion City Schools. The purpose of the program is to provide support and encouragement to students in a variety of ways. As a soccer coach, Palmer knows the difference a mentor can make in the life of a child who would benefit for the extra encouragement a caring adult can provide. Mentors are matched with a student and meets with them for one hour, once per week. They are welcome to meet with each other to simply have lunch or work on homework during school hours. Palmer is grateful and optimistic about his future with RSVP. Courtesy photo Sarah Capretta and Eric Palmer of RSVP of Marion, Crawford, and Morrow Counties in their office at 138 Harding Way West. Palmer recently took over Capretta’s position as RSVP Coordinator after Capretta moved into a bigger role with the organization. https://www.galioninquirer.com/wp-content/uploads/sites/38/2018/02/web1_27711461_10103471200598362_64568274_o.jpgCourtesy photo Sarah Capretta and Eric Palmer of RSVP of Marion, Crawford, and Morrow Counties in their office at 138 Harding Way West. Palmer recently took over Capretta’s position as RSVP Coordinator after Capretta moved into a bigger role with the organization.